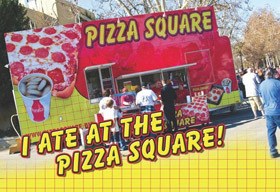 Pizza Square is always on the lookout for motivated, high-energy individuals to fill positions at our operations. If you think you’re applying for just a job at a pizza place think again. Whether you’re looking for a full-time career or seasonal job working at the L.A. County Fair or other venues, we have something for you. We look for individuals as diverse as our organization who enjoy working on diverse projects in a fast paced environment while giving back to a community that has supported us since 2009. We are a mobile food concession operation based in Southern California. Our company is dedicated to bringing the highest quality products and service to major venues. We are committed to a standard of excellence in the products and services that we provide to our customers and in the quality of work expected of our exceptional team members.